It’s been a crazy, hectic week for me – and it’s only Wednesday! Between moving, re-painting, work, planning surprise parties & trying to see friends, I am wearing myself thin. As my mother would say, I’ve been burning the candle at both ends. Frazzled as I am, I hung this poster as a little reminder to breathe. Coming out of Britain during the 1940’s, a set of posters were displayed around London to keep morale up during the war. 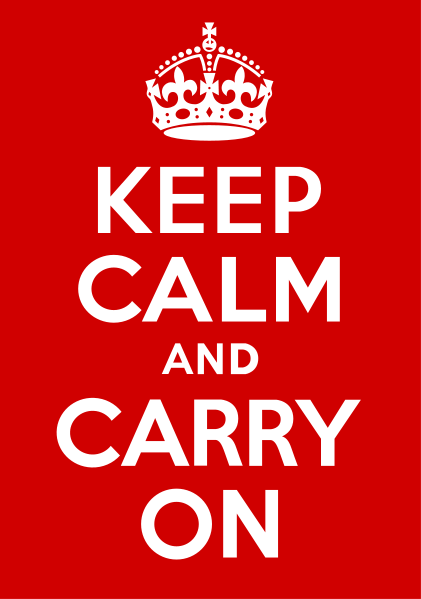 The ‘Keep Calm and Carry On’ poster was said to never have been seen by the British public during these times, and instead kept private in the offices of the government. It made its resurgence almost sixty years later, and can now be seen all over the interwebs – often with a play on the original phrase. It’s getting me through my hectic, non-sense filled days, kindly reminding me to ‘Keep Calm and Carry On’. Should you find yourself as frazzled as me, here’s to hoping it calms you too!